Once the Sous Chef at New Orleans’ famous Commander’s Palace, Chef Jim Richard (one of 30A’s hottest culinary talents) insists on using only the freshest ingredients and Gulf catches in this fun and casual fish camp. The wait at Stinky’s Fish Camp may be a painfully long one, but locals and repeat visitors know that it’s for good reason. Stinky’s Fish Camp sits on a coastal dune lake in Dune Allen, just across 30A from the beach. 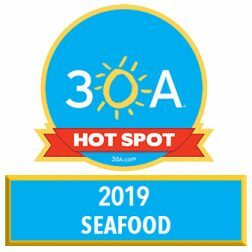 Stinky’s is repeatedly voted one of South Walton’s hottest spots for fine seafood, casual dining and raw oysters (Stinky’s is one of the few places left that serves “select” Apalachicola oysters… the best of the best). If you’re a party of two, be sure to try the Stinky’s Stew. There are currently no special events scheduled at Stinky’s Fish Camp. Click here to add an event.